Have you been looking for creative ways to learn how to organize a small kitchen? Living in a home that has a smaller kitchen doesn’t have to be a nightmare. The secret to falling in love with your tiny kitchen is organization and using all of your available space. If you’ve been looking for budget-friendly ways to organize your small kitchen, we’ve got a few easy to follow tips to help you create the tiny kitchen of your dreams. This article takes a look at some real-life tips and tricks for organizing your small kitchen. Keep reading to learn more. Many people ignore the value of using their walls for vertical storage, especially in kitchens. Using vertical storage in your kitchen can drastically open up your kitchen and make it easier for you to find the things that you need for everyday cooking in your kitchen. Create vertical storage by adding shelves to the walls of your kitchen to store, pots, pans, canned goods and dried foods that you would normally try to secretly jam into a cabinet. Store pots and utensils directly over the stove to free up cabinet space for other items. Use a hanging pot rack or install a shelf directly over the stove for ease of use. Use the space inside of your cabinet doors to add shelving and racks to store items like canned goods, spices, sodas, and dried foods. You can also add under-the-shelf cabinet organizers that create an extra shelf for storing plates and dishes. Your pantry is also another great candidate for creating extra storage by adding inside shelving and racks. You can use the same organizing strategies for your pantry as we previously discussed for cabinets. Make use of inside pantry doors for shelving and racks to increase your storage space and decrease kitchen clutter. Using clear labeled containers can save you tons of time and go a long way towards getting your small kitchen more organized. Clear containers allow you to easily see inside to determine the contents of the container and are a great way to organize dried foods like cereals, sugars, and flours. You will save lots of space by storing your dried foods in clear containers instead of the original bulky packaging that they came in. Clear containers are usually square or rectangular and provide for easy storage on shelves and inside of cabinets and pantries. 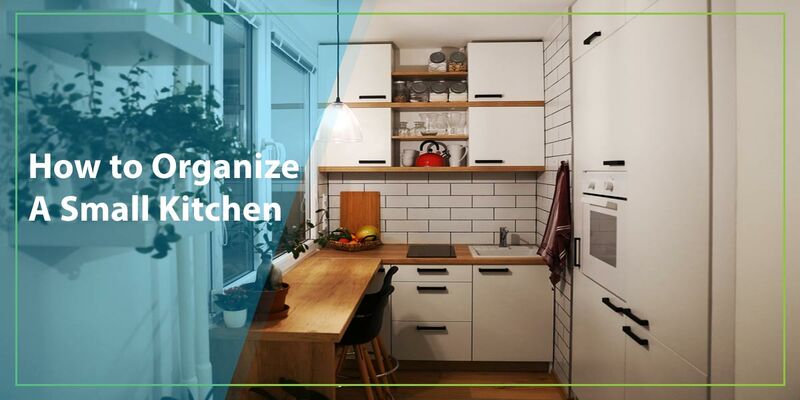 Now that you have some ideas for how to create more space and organize your tiny kitchen, you should feel more confident when the time comes to making the changes. You can find the budget-friendly racks and shelving mentioned here at most department stores, hardware stores, or online marketplaces at reasonable prices. Once you see the difference in your new kitchen after making these easy improvements and claiming back your kitchen space, you may become an expert at teaching others how to organize a small kitchen!